Most social media users don't believe the reports, saying there could be yet another resurrection miracle on the way. Did you saw Elliot mr Lukau? He's dead again. So, did Lukau's Elliot really die this time? Unfortunately this time around there is no resurrection...death is real.. According to reports, the man who was "raised from the dead" by South African prophet, Pastor Alph Lukau back in February has died. 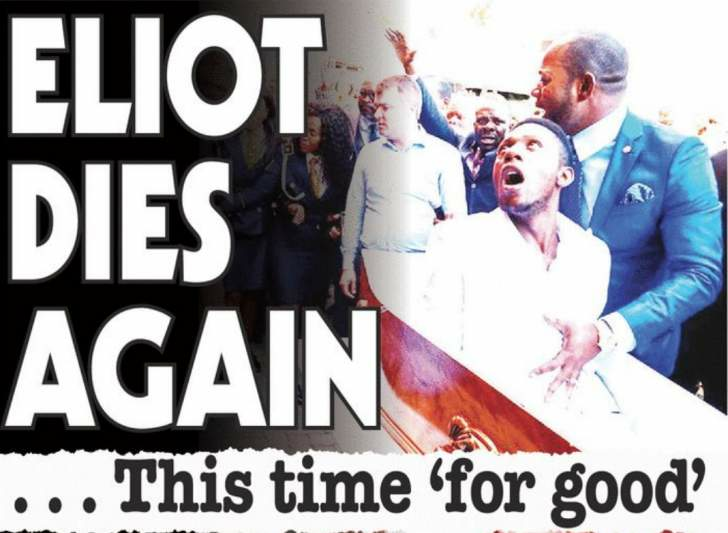 Elliot made headlines earlier this year after a video of him being resurrected at Alph Lukau's Alleluia Ministries International church emerged. In the video, a woman shouted: "Pastor Alph, something is happening outside. There is a family that is about to bring a corpse to Zimbabwe, but they are saying something is happening, man of God. "As the funeral parlour drove over the church door, their neighbour said it seemed like the fingers of this dead corpse were beginning to move," she added. He asked the workers to open the coffin. He spoke to the deceased's older brother before the coffin was completely taken out of the hearse. According to the deceased's landlord, the man had gotten sick and started "coughing a lot" on Friday. "We took him to the hospital and they said they could not help him because he did not have papers, so we took him to the doctor and he died there," she claimed. "Rise up!" he shouted, before the man got up and sat in the coffin, looking confused, like a modern-day Lazarus. Lukau and his lawyers have claimed that Elliot had been totally unknown to Lukau prior to the "miracle", though some individuals Cutting Edge interviewed alleged this was unlikely and that the man's family was apparently known to have worked with the church prior to Elliot's "resurrection". She claimed the church had offered her payments of R1,500 per month to stick to the story. The church allegedly also created fraudulent medical paperwork using her name in an attempt to convince congregants that she'd gone from being HIV positive to negative. "I was not [HIV] positive. I was never positive." She claimed she hadn't even known this was going to be done on her behalf, but she'd played along anyway. Blessing Kwemelao claimed to have recruited people such as Revesai to be part of Lukau's "miracles", with his recruits allegedly then trained to act as though they had various disabilities that could be healed, or to play along that they'd been cured of disease, including cancer. Kwemelao admitted he had worked as part of three to four teams to find people to allegedly take part in staged miracles. He said that, due to his strong build, he had helped to carry actors with fake disabilities and had given people stage cues during services for when they should come forward to claim they'd been healed. Elliot's timber yard employer, Vincent Amoretti, repeated allegations that he had heard his employee had previously done "stunts" with the church. "From what I can understand, his wife, sister and aunt work with the pastor (Alph Lukau). And that's how he got in." Cutting Edge also visited Elliot's residence in Nellmapius, east of Pretoria, where they found a community divided about the resurrection video, with most of the individuals they found saying they were not convinced. "Grace", one of Elliot's claimed church friends from Nellmapius, told the show that people agreeing to act as "cripples" could be paid R3,500 each. "They don't want South Africans … they want Zimbabweans because they're untraceable." Elliot's friend "Paul" claimed he'd last seen the resurrected man on February 21, a day before he allegedly died. "He never died. He was also never sick. He left on Thursday," Paul said. "They only act to get paid and make ends meet." According to Elliot's friends, he has probably fled the country and gone back to Zimbabwe.